Despite the maturity of organic chemistry, it can still be very challenging to identify optimal methods for synthetic transformations that perform as well in real–world manufacturing processes as they do in the laboratory. 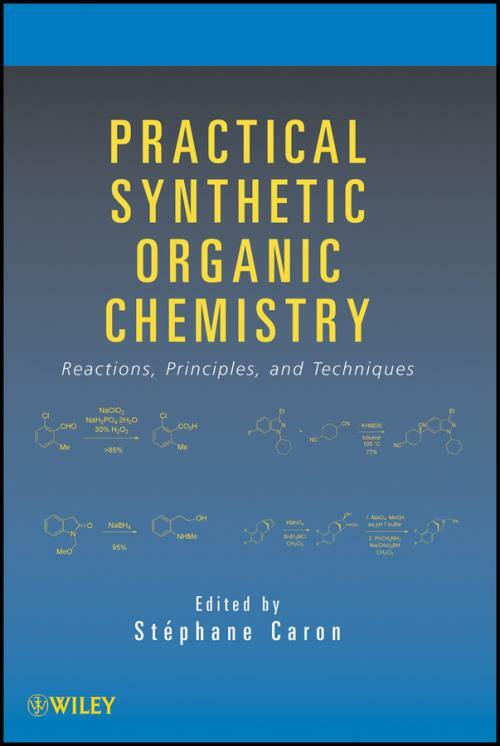 This detailed and accessible guide attempts to address this vexing issue and deliver proven methodologies practicing synthetic chemists will find valuable for identifying reaction conditions that work reliably over the broadest possible range of substrates. Incorporating such an extraordinary wealth of information on organic chemistry and its related fields into one complete volume distinguishes Practical Synthetic Organic Chemistry as an incomparable desktop reference for professionals and an invaluable study aid for students. Chapter 1: Aliphatic Nucleophilic Substitution (Jade D. Nelson). Chapter 2: Addition to Carbon–Heteroatom Multiple Bonds (Rajappa Vaidyanathan and Carrie Brockway Wager). Chapter 3: Addition to Carbon­Carbon Multiple Bonds (John A. Ragan). Chapter 4: Nucleophilic Aromatic Substitution (Stéphane Caron and Arun Ghosh). Chapter 5: Electrophilic Aromatic Substitution (Stéphane Caron). Chapter 6: Selected Metal–mediated cross–coupling reactions (Stéphane Caron, Arun Ghosh, Sally Gut Ruggeri, Nathan D. Ide, Jade D. Nelson, and John A. Ragan). Chapter 7: Rearrangements (David H. B. Ripin). Chapter 8: Eliminations (Sally Gut Ruggeri). Chapter 9: Reductions (Sally Gut Ruggeri, Stéphane Caron, Pascal Dubé, Nathan D. Ide, Kristin E. Price, John A. Ragan, and Shu Yu). Chapter 10: Oxidations (David H. Brown Ripin). Chapter 11: Selected Free Radical Reactions (Nathan D. Ide). Chapter 12: Synthesis of "Nucleophilic" Organometallic Reagents (David H. Brown Ripin). Chapter 13: Synthesis of Common Aromatic Heterocycles (Stéphane Caron). Chapter 14: Access to Chirality (Robert W. Dugger). Chapter 15: Synthetic Route Development of Selected Contemporary Pharmaceutical Drugs (Stéphane Caron). Chapter 16: Green Chemistry (Juan C. Colberg). Chapter 17: Naming Carbocycles and Heterocycles (Heather N. Frost and David H. B. Ripin). Chapter 18: pKa (David H. Brown Ripin). Chapter 19: General Solvent Properties (Stéphane Caron). Chapter 20: Practical Chemistry Concepts Tips for the Practicing Chemist or Things They Don′t Teach You in School (Sally Gut Ruggeri).